Wirebound notebook is designed for left-handed people with the wire binding on the right side. Wire binding has coil-locked wire ends. Notebook contains 100 sheets in a one-subject format. Cover has a built-in pocket to store loose sheets and other items. Cover and each sheet are three-hole punched to secure notebook in standard three-ring binders. 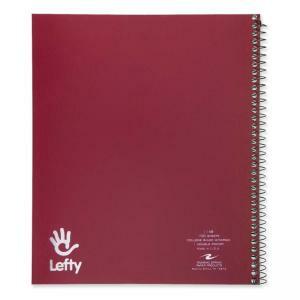 Each sheet is college-ruled with a margin and perforated for clean tear-out.